Alumnus Brett Dennen helped kick off our 50th anniversary this month by providing the soundtrack for UC Santa Cruz's 50 years young video. Turn it up! In its 50th year, UC Santa Cruz continues to see unprecedented undergraduate interest – attracting more than 50,000 student applicants, including a 10 percent increase in California students. 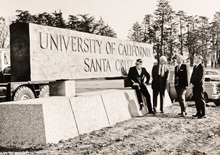 As we celebrate the 50th anniversary of UC Santa Cruz in 2015, here are 50 things you might not know about the campus. A statue of a sea lion—once UC Santa Cruz's short-lived campus mascot contender—stands proudly outside Thimann Lecture Hall. And yet there is no statue of the mighty Banana Slug—the mascot that supplanted the sea lion—anywhere on campus.